I was having a great conversation with my 9-year old the other day about the role of luck in success. You know my take– sure I work reasonably hard and I’m smart, but it is little more than luck that I was born to highly-educated upper-middle class parents in an educated, stable community and that I have a brain that is good at processing information and deferring gratification. I think we all know that luck (and context– which is closely related) matter, but I think in most things, people tend to under-estimate the impact of luck and random factors and I think this is especially so among political conservatives. Anyway, it reminded me of this article from back in February that I meant to blog about back at the time. The divorce of the oil billionaire Harold G. Hamm from Sue Ann Arnall has gained attention largely for its outsize dollar amounts. Mr. Hamm, the chief executive and founder of Continental Resources, who was worth more than $18 billion at one point, wrote his ex-wife a check last month for $974,790,317.77 to settle their split. She’s appealing to get more; he’s appealing to pay less. Yet beyond the staggering sums, the Hamm divorce raises a fundamental question about the wealth of executives and entrepreneurs: How much do they owe their fortunes to skill and hard work, and how much comes from happenstance and luck? In a filing last month supporting his appeal, Mr. Hamm cites the recent drop in oil prices and subsequent 50 percent drop in Continental’s share price and his fortune as further proof that forces outside his control direct his company’s fortunes. Lawyers for Ms. Arnall argue that Mr. Hamm is responsible for more than 90 percent of his fortune. While rooted in a messy divorce, the dispute frames a philosophical and ethical debate over inequality and the obligations of the wealthy. If wealth comes mainly from luck or circumstance, many say the wealthy owe a greater debt to society in the form of taxes or charity. [emphases mine] If wealth comes from skill and hard work, perhaps higher taxes would discourage that effort. Sorting out what value is created by luck or skill is a tricky proposition in itself. The limited amount of academic research on the topic, which mainly looks at how executives can influence a company’s value, has often found that broader market forces often have a bigger impact on a company’s success than an executive’s actions. Of course, skill, hard-work, etc., matter. Just not as much as most political conservatives think they do. Furthermore, I would argue that brains and a good work ethic are themselves substantially determined by luck. Not to argue that these things should not be rewarded in the marketplace, but things look different when you realize how much luck is involved. The contest began in 2007, running annually. In 2009, The United Nations Educational, Scientific and Cultural Organization and the International Astronomical Union designated TWAN as a Special Project of the International Year of Astronomy. The second place winner in the Beauty category is Brad Goldpaint of the United States, for his photo “Moonlit Darklings” taken in July 2014. The moonlight strikes Mt Rainier in Washington, northwestern USA, as the Milky Way drifts across the night sky. No, it’s not all about race. But don’t let anybody tell you it’s not important in the transformation of Southern politics. Almost literally overnight, the chimera of consensus around the Confederate flag as a divisive but misunderstood symbol of “heritage” or “Southern pride” fell away, revealing the banner for what it is. The obscenity of the flag and the murderous racism it represents have dominated a national conversation about the American way of hate and violence for all the right reasons. When 20 dead first-graders cannot result in new and meaningful national measures on gun control or even in weak and largely symbolic national measures on gun control, then perhaps—if you are of a certain cast of mind—that is the moment to retreat on gun control. Mostly, though, we find other things to talk about. The reason that we have gun massacres in numbers wildly out of proportion to any other rich country is because we have too many guns. When gun massacres have happened elsewhere—as they sometimes have, in Canada and Scotland and Australia and elsewhere—the common-sense response has been to change the laws, and, almost always, after the laws are changed the massacres end. In the United States, they continue. It seems like a good bet that changing the law here would change that. All the facts are in; all the social science is long settled; the constitutional positions are clear, if contested, and the wiser way known and shared by mankind. On one side are facts, truth, and common sense. On the other, an obsession with dark fantasies of individual autonomy and power—the sheer fetishistic thrill of owning lethal weapons. On one side is the sanity and common sense shared by the entire world; on the other, murder and madness and a strange ongoing American mania. If we don’t change, then, well—it will happen again, again. And then again. Powerful stuff. That said, I’m a little more skeptical of the power of policy change in the US context giving how deeply gun-owning (and totally irrational fears on the part of gun-owners) is embedded in our culture. 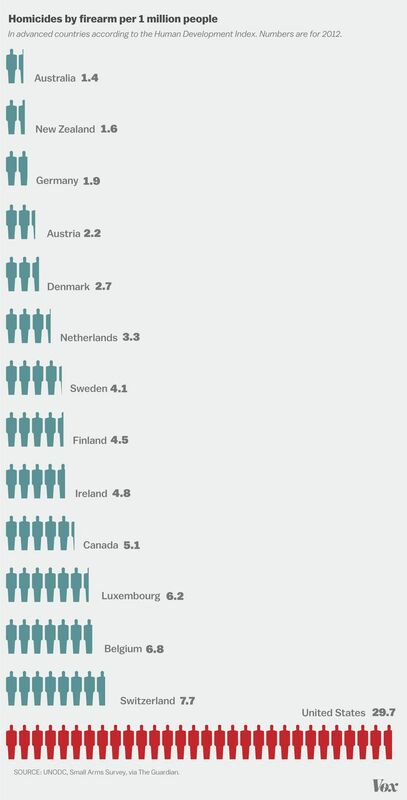 I don’t know that we could ever get to Western European levels of gun violence, but we could sure do a lot better. Some time after I bought my first gun, I got a robocall from the National Rifle Association, asking me to join. After the customary “Please stay on the line…” from a pleasant but earnest voice, I recoiled from the barkings of an angry-sounding man. Did I know that Barack Hussein Obama and European leaders are meeting on American soil right now, at this very moment, to plot the confiscation of my guns? The caller continued with his insinuations of an imminent United Nations plot against America, but before I could be handed off to a live operator, I hung up the phone. The Charleston massacre probably won’t result in gun reform, but its survivors have challenged the NRA’s bleak, seething worldview by suggesting that kindness can be the dominant mood of our public life. By offering perhaps premature forgiveness to the young man who killed their loved ones with a legally purchased Glock semiautomatic, they have shown us the possibility of living a more open, less timid existence. They imagine a world of joy, community and shelter, not fear, hatred and violence. This is a static image– the animated charts over at are even cooler.